Rurouni Kenshin is the big screen adaptation of a very popular manga of the same name. I hadn’t read the manga until I saw the trailer for this movie. After that I hurriedly hunted up the manga to read and found that it was pretty good. Thankfully, Ohtomo Keishi has managed to make a very good film version. I have no major complaints about it as an adaptation. Comics don’t necessarily translate well to live-action, especially not Japanese comics, where the characters often have hair in completely unnatural colours (and male characters often have long hair – which doesn’t look good on every actor), or have very distinctive/odd/impossible physical attributes, or have quirks of speech or actions that may not translate well into live-action. Kenshin, for one, has long red hair and speaks in a quaint, old-fashioned style. Fortunately, actor Sato Takeru manages to pull off both the hair and the speech mannerisms in a completely believeable way. Casting him in the role was a stroke of brilliance. The rest of the cast did quite well too, although I wasn’t too fond of Aoi Yu as Megumi. Kagawa Teruyuki did very well as the slimy businessman, Kanryu, managing to be hilarious yet not entirely ridiculous; and I was relieved that Takei Emi played the character of Kaoru well enough that I didn’t dislike her – Kaoru is a rather dull character, despite being the leading lady, and since she has no major personality flaws (unless you count being a bad cook as a major personality flaw), she sometimes came across as a bit flat and irritating in the manga. Tanaka Taketo’s Yahiko didn’t have a lot to do in the movie, but the kid did well with the bits that he had. The film deals only with the first major narrative arc in the manga and this is a wise choice as the first arc is quite self-contained. Main characters are introduced and established fairly rapidly, and exposition is handled deftly without interrupting the plot. The story flows very well and proceeds at an even pace, balancing time between calm sequences and frenetic action. Given that the main character is a swordsman, sword fights are a prominent feature of the manga and there are quite a number of them in the film. 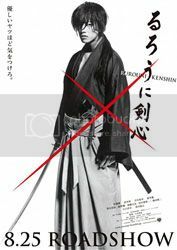 Kenshin is noted for his speed and agility, and the fight choreography in Rurouni Kenshin was generally well-tailored to show off his signature skills. It was a little disappointing that there were not more fights that were impressive, though they were interesting enough to watch. (There was one move by another character that looked really fake and forced, but as it only appears briefly I can overlook it. hahah) The one that I found the best to watch was the fight in the Kamiya dojo with the bunch of ruffians, where he pretty much takes them down bare-handed. Though there are fights a-plenty, it is not a violent movie and the body count stays low for such a film – logical, since the protagonist doesn’t wish to kill anyone. It’s a nice change from other typical action movies. Big thumbs up to the movie. I didn’t know that there was big screen movie for it until two months ago.